This touring production of The Elixir of Love is ingenious in that it capitalizes on the fact that the social context described in Elixir is temporally generic. This could be any naïve small town, anytime. The show is tweaked as it travels to inject local touches from the early 20th century. Elixir’s story is familiar, drawing from archetypes like Aladdin and serving as a precursor to Broadway shows like Oklahoma!. 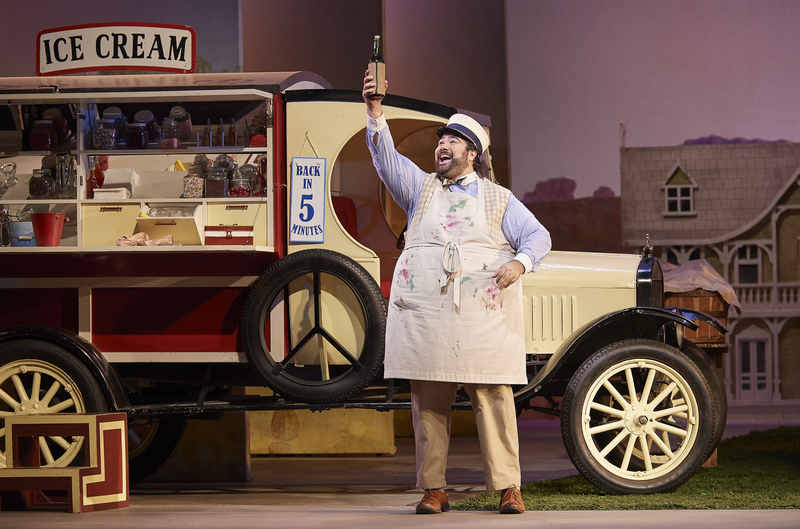 In this opera, Nemorino, a naïve rural ice cream man who is unfettered by ambition falls for the most affluent and sophisticated woman in town, the beautiful Adina. It seems hopeless, especially when Belcore, a dashing military recruiter, comes to town with an entourage of adoring, uniformed young lads. Swaggering Belcore not only hopes, but expects to seduce the charming Adina, and wastes no time in making that happen. This braggadocious approach would normally make Adina laugh and walk away with an upturned and wrinkled nose. Today, Belcore’s brash advances are entertained because, under the mysterious effects of a “magical” elixir provided by nomadic snake-oil peddler Dr. Dulcamara, Adina is consumed with a desire to make love-sick Nemorino jealous. In addition to the fact that this frothy, comfort food story is the perfect succour to the complicated times we are living in, the opera features some of the most spectacular singing of the bel canto style. Florid and sweeping melodies of such sublime quality confirmed that I am in the “music sends shivers down your spine” set. The performance featured the familiar faces of three COC ensemble graduates who have done the program proud internationally. They and a number of debut performers put on a lively and engaging show under the direction of James Robinson. Simone Osborne’s performances as Oscar (Un ballo in maschera) and Lauretta (Gianni Schicchi) in recent years stand out for me. Her Adina in this performance demonstrated a similar consummate understanding of the role. She was vocally and dramatically effervescent, combined with the deep introspection needed for this character. It is a silly show, but the young couple do a lot of thinking as they figure out their priorities in love and life. This fine line between a carefree experience for the audience and a profound experience for the characters is never more evident than in “prendi per me sei libero” when Adina finally confesses her unlikely love for Nemorino. Osborne soared through the highs, lows, and rapids of this timeless aria with rich, caramelized sweetness and effortless charm. Her command of physical comedy was also a delight, and I am still chuckling about her slide down a bannister. Meanwhile, I cannot imagine a more perfect Nemorino than Andrew Haji; it is as though the role were prophetically written for him. Haji’s Nemorino was guileless and immediately loveable. He brought a vulnerability and candour to the role that was both light and thoughtful. Haji’s voice is hearty and fresh with the crisp sweetness of a summer apple. His performance of “Una furtiva lagrima”, sung when he believes all hope is lost, was poignant and endearing and teased out every last spine tingle. I can only imagine that Haji is working on his drunk walk right now, as he is likely to have a career of performing this role to rival Pavarotti’s. Gordon Bintner was riotously funny as swaggering dude-bro Sergeant Belcore. His performance provided an opportunity to mock the sh** out of every idiot who has ever tried to come on to you with boastful lines and physical aggression. Bintner’s timbre is brassy and luminescent and tailor-made for the bravura strutting that takes place in “Come paride vezzoso”. Andrew Shore in his COC debut was hilarious in the role of travelling grifter Dr. Dulcamara. His performance of “Udite, udite o rustici” (wherein he rattles off all of the ailments and afflictions his magical elixir is purported to remedy) exploited the over-articulated staccato rhythms of the piece to great comedic effect. One of the most delightful aspects of setting the production in the early 20th century is that it provided the opportunity to use some tricked-out classic motorcars as set pieces. Nemorino’s ice-cream truck and Dr. Dulcamara’s travelling contraption designed by Allen Moyer added an element of wonder and fantasy to the piece. L’elisir d’amore is good, simple fun with lots of very pretty, fancy singing. It is suitable for seasoned opera-goers looking for something frothy, and newcomers to opera looking for something approachable. You’ll leave feeling like you got a nice break from over thinking it. Show times are 7:30 PM on October 17, 21, 27, & November 2, with additional matinees at 2:00 PM on October 15 & 29, and 4:30 PM on November 4.